If everyday consumers and young people are craving positive economic indicators, they can no doubt turn to the de-facto legislation of an alternative digital currency in Europe’s most powerful country for inspiration. In an unprecedented move, the German Federal Ministry of Finance declared in a statement earlier this month that Bitcoin is not only an acceptable “unit of account,” but also can be classified as “private money,” granting the digital currency its first official positive recognition by a state. The statement came as a response to a parliamentary inquiry by MP Frank Schäffler, a member of the Free Democratic Party with a seat on the German Parliament’s Finance Committee. For the struggling youth in Germany and across the world, this is a welcome and necessary change. Bitcoin, the decentralized digital currency encrypted with the latest in cryptographic protections, has been used as an alternative to the current monetary system by thousands of tech entrepreneurs and curious digital natives since it was conceived in 2009. In the last month alone, the price of a Bitcoin has shot up nearly 30 percent to its current price of 90 euros. It previously reached its all-time high of 200 euros at the peak of the banking crisis in Cyprus, given that the digital currency became an immediate alternative to worried consumers around the world. 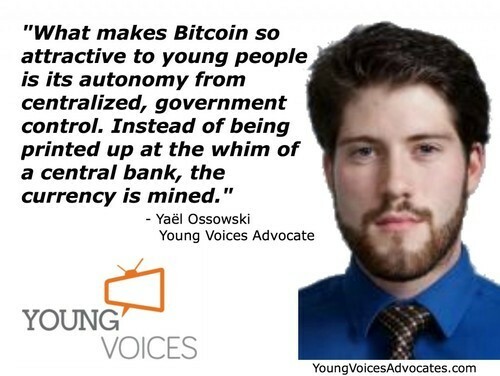 What makes Bitcoin so attractive to young people is its autonomy from centralized, government control. Instead of being printed at the whim of a central bank, the currency is “mined” by thousands of computers solving a complex algorithm. It relies on crowdsourcing of bandwidth and source coding to keep transactions active and safe from hacking. The more Bitcoins are mined, the more difficult it becomes to create one, ensuring that the currency will not fall into the trap of inflation because of its set finite amount of 21 million Bitcoins. But more than just a currency safe from government hands, the fact that it exists only in the form of a chain of characters ensures that it remains purely digital, allowing instant trades at the fraction of the cost of credit cards. This is easily accomplished by the use of a smartphone wallet app or by exchanging Bitcoin addresses between people. This facilitates trade and removes the middlemen of credit card companies or even banks. Already in the streets of Berlin, with the highest concentration of Bitcoin transactions in the world, the currency has become popular among bars, restaurants, printing shops and even a high-class boutique, according to the Guardian newspaper. The existence of this crypto-currency has given young people a true monetary alternative to the national currencies which are only propelled by debt and arbitrary interest rates. This is a welcome sign in Germany, which less than 90 years ago was marred by a failing currency and destructive hyperinflation which created an economic environment conducive to radical and dangerous worldviews. Moreover, low interest rates maintained by central banks provide little to no incentive for young workers to begin saving their money, so they are encouraged to spend as much as possible in order to help sustain the current monetary status quo. Since young people are already so keen at conducting business and the majority of their communication online, the transaction costs to using a purely digital, online currency are extremely low. What better for the next generation than to have a system which encourages choice, rewards innovation, and fosters a deep respect for the value of work? On a European continent currently contemplating another billion Euro bailout for a struggling member state, the recognition of Bitcoin by the German Finance Ministry is a pivotal moment for young people to begin to control their own destiny. As the taxpayers of tomorrow, they are ultimately the ones who will be stuck with the bill with today’s excessive spending and government devaluation of national currencies. For the sake of our future, let’s give young people a chance with an alternative currency. If you’d like to speak with or book Yaël or any of our other Advocates, please contact Young Voices now.